Hyde Park UMC's downtown Tampa campus has been dubbed "The Portico" in recognition of its desire to welcome like a front porch. 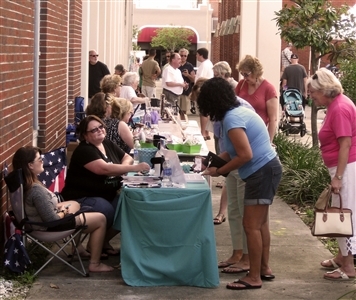 An Urban Art Mart at The Portico draws a crowd of about 500. Photos from Hyde Park UMC's website. 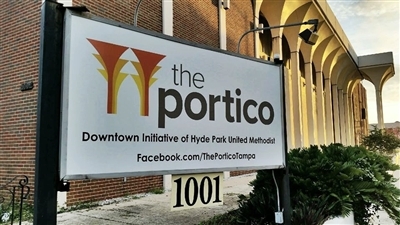 TAMPA --Hyde Park UMC’s outreach ministry to downtown Tampa has an official name: The Portico. Renovations to a 1948 chapel have begun on the campus at 1001 N. Florida Ave., and plans are underway for improvements to the main sanctuary and office building. Efforts also include laying the foundation for what will become the worship community, said Rev. Justin LaRosa, pastor at the downtown campus. The congregation’s name is Hyde Park Downtown to reflect its ties to the well-known church in South Tampa, but the campus’ name is The Portico. “It’s one church, two campuses,” LaRosa said. That’s significant, said John A. Mathew, Portico lay leader, who has been involved with the expansion effort since it was known as The Downtown Initiative. “I think this past year, we, along with the church (Hyde Park UMC), had an awareness that no, we’re not starting a new church. Rather we’re starting a second campus of Hyde Park United Methodist,” Mathew said. The Portico occupies the former grounds of First UMC, Tampa, which closed in 2011, leaving a legacy of God’s work dating back to the 1800s. The new ministry aims to build on that legacy with both worship and community service, LaRosa said. Like a building’s portico, or sheltered space, “we want to provide a sheltered entrance for people to enter” into a connection with God, the pastor said. The Portico wants to establish an inviting presence, much like a front porch, where people can gather to converse and connect. Rev. 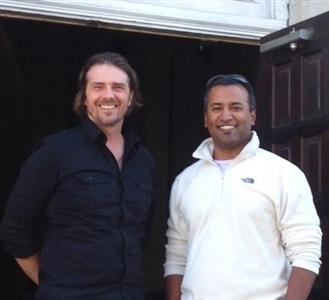 Justin LaRosa, left, pastor at Hyde Park UMC's campus The Portico, stands with lay leader John Mathew in front of the church downtown Tampa. Photo from Justin LaRosa. “In Wesleyan theology, the front porch of faith is what he (John Wesley) calls God’s prevenient grace -- the grace that precedes human decision,” LaRosa said. People have begun meeting in small groups on Sunday mornings and Wednesday nights to build community and pray together about creating the congregation that will meet at The Portico, LaRosa said. Worship services will begin downtown when there’s an obvious need, LaRosa said. “It’s not timeline dependent; it’s people dependent,” he explained. Currently, the campus offers meditation and silent gatherings, open to all, on Tuesdays and Thursdays. On the third Thursday, the gathering includes music. Katina Delk, a member of a small group that’s helping to shape The Portico’s future, said she’s noticed people of all walks of life attending the meditation service. That’s what The Portico wants to do: attract a wide range of people. “It’s not just a church,” said Delk, who lives in Tampa’s Channelside, on the edge of downtown. She said ministry planners envision a public gathering place that also provides space for various agencies offering services to the downtown community. The campus is reaching out to the broader community in various ways. On DocNights, the last Wednesday evening of the month, guests can enjoy screenings of documentary films. An event called Urban Art Mart recently attracted 42 vendors and a crowd of about 500. The Portico also organizes community service days and has set aside a room to serve as a central supply depot for agencies that assist in the rescue and rehabilitation of victims of human trafficking. 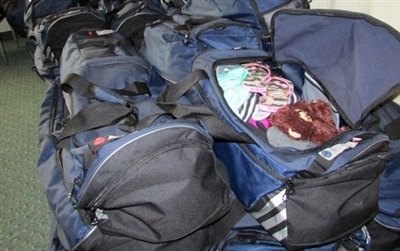 Among other ministries, The Portico provides space for organizations that collect comfort items for human trafficking victims. Photo by B.C. Manion. Courtney Beitler, who leads the events and service team, is excited about recent developments and The Portico’s potential. “This past year – the events that we’ve held – you see everything that we’ve dreamed about for the last few years come together. It’s really awesome,” she said. Those involved in the planning have learned to go with the ebb and flow. “I’m not always comfortable right away – ‘O.K., which way are we going and what are we thinking?’ – but it’s exciting,” Beitler said. Mathew describes that experience as healthy tension. “The fact that we have a core purpose and we’ve got sort of a vision for how we are going to live out that purpose – those things keep us centered,” Mathew said. “At the same time, there are all sorts of ideas for tactics and taking that purpose and that vision forward. If we don’t weigh those ideas and those tactics and those opportunities against the core purpose, we could easily get distracted,” he said. Mathew believes that Hyde Park’s two campuses will be mutually beneficial. Hyde Park UMC enjoys a great history and a vibrant ministry, Mathew said, but new life from the downtown campus is bound to bring fresh energy to the next stage of Hyde Park UMC’s evolution, he said. “I do almost view it as almost a two-way flow of innovation and of ministry that ultimately will result in more ministry to Tampa, in general.” Mathew said.